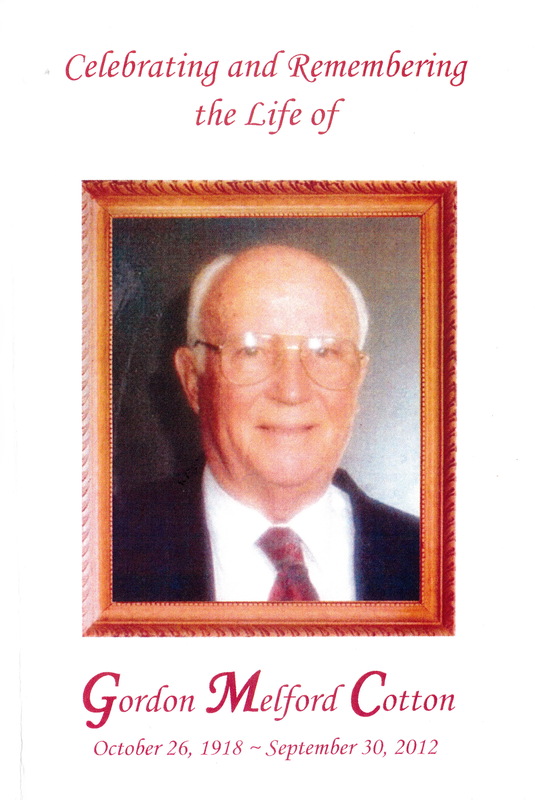 We are sad to report that Mr. Gordon Cotton, Waltrip's first Principal, passed away on September 30, 2012 in Trinity, Texas. Gordon Melford Cotton passed away Sunday evening, September 30, 2012 at the Avalon Place Nursing Home in Trinity, TX. He was born in the North Walker County Community of Kittrell on October 26, 1918. He was the only son and one of three children born to Robert Frank and Versie (Williamson) Cotton. He was 93 years of age. Mr. Cotton was a “Class of 1935” graduate of Huntsville High School and a graduate of Sam Houston State Teachers College. He played on both the high school and college basketball teams. He served his country in the U.S. Navy during the time of World War II. He retired from the Houston ISD in 1979 after 42 years of service in numerous capacities including basketball coach, assistant principal, principal, administrator, Area 1 Superintendent, and Deputy Superintendent for Administration. Mr. Cotton was active in the Houston community. He served on the board of directors at Reagan Commerce Bank and the Houston Teachers’ Credit Union. He was a member of the Greater North Houston Kiwanis club and served on the education committee of the Houston Chamber of Commerce. The Cottons retired to Westwood Shores in Trinity in 1980 where he continued to contribute to the community. Here, he served as a trustee of Westwood Shores and as president of the Westwood Shores Men’s Golf Association. He served on the board of directors for the Lake Area National Bank. He, also, was a member of the Trinity Hospital Board where he strongly supported the vision for a new hospital. Mr. Cotton was an active member of the First United Methodist Church of Trinity. Mr. Cotton had many interests. He enjoyed his farm, especially tending to the pecan trees that were given to him by the Waltrip faculty. He enjoyed hunting, wild hog trapping, fishing, gardening, golfing, riding in the gold golf cart that was given to him when he retired, playing 42 and 84, and watching sports on television. Left to cherish his memory are his loving and supportive wife of 64 years, Marjorie Lee (Weis) Cotton; son Ralph Gordon Cotton and wife Sandra of Colleyville, TX; grandsons, Nicholas Cotton of Colleyville, and Ryan Cotton of Boston, MA; twin sister, Dorothy Tipton of Houston; sister Marguerite Croucher of Houston; nephew, David Croucher and wife Yolanda; niece, Diane McCharen and husband Bob. Numerous other relatives and many friends also survive.